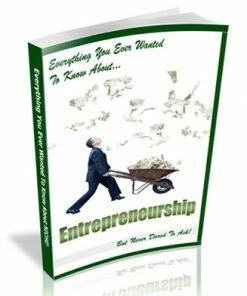 Entrepreneurial Drive Ebook and Videos includes all you need to profit from a huge niche with a big tightly related upsell and master resale rights. Every year in the United States, more than 627,000 new businesses open, according to estimates from the Small Business Administration, SBA. That’s more than half a million people deciding to leave their 9 to 5 job and set out on their own. Unfortunately, not everyone is cut out to be a small business owner, as evident by the nearly 595,000 businesses that close every year. To those companies that are able to get off the ground and running, only 51 percent are able to remain in business for more than five years. With such disheartening numbers, you may be wondering if you should venture out on your own and start a business, and whether or not you’ll succeed as an entrepreneur. The good news is, anyone can become a successful entrepreneur with the right mindset. The mindset of successful entrepreneurs is different from everyone else. There are many ways in which they think and act differently. When you know what you are looking for, you can begin to think and act like a successful entrepreneur. When it comes to creating a successful business, like any journey, you need to have a map. Having a plan of where you need to go will help you get to your destination in the fastest time possible. 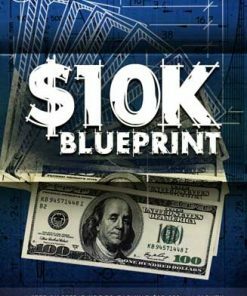 This book is meant to be your map and help you become a successful entrepreneur, as fast as possible. To be truly successful, in anything that you do, you have to have the right mindset. This is true whether you are an elite athlete, a world champion, or a billionaire business owner. All of these people share a specific mindset, and if you want to be a successful entrepreneur and be successful in life, you will need to develop this same, robust and focused mindset. The more important question that you will have to ask yourself at the beginning of your journey to entrepreneurial success is why are you doing this? The answer that you give is one that will have to last you for the majority of your life, so the answer better be good. It has to be good enough that you won’t falter, even at the worst of times. Staying focused and driven to reach your goals and find success will require you to rewire your brain. However, if you’ve never reached a low point or a turning point, how are you going to do this? How can you get into the zone and stay there, all the time, no matter what? Finding the zone and staying there month after month, year after year isn’t an easy task. That’s why the question of why you’re doing this is so important. 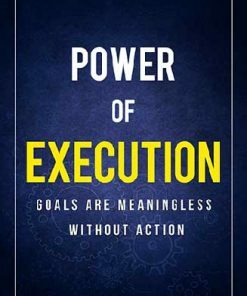 Ebook – 78 page PDF that tells how to develop the grit, drive and hustle to make your entrepreneurial goals a success. Covers mindset, self control, fearlessness successful habits and so much more. Book has a professional lay out with quality images inside, sure to make you look like the professional. Sales Page – Everything you need to resell the Entrepreneurial Drive Ebook and Videos Package. Since it comes with master resale rights, you can resell as many copies as you want and you get to keep 100% of the profits on every single sale you make. Buy once and sell over and over. The beauty of digital products. With a high quality sales page and a matching download page. Just add your payment link and your download link, upload the two web pages and it’s ready to make money for you on auto-pilot, even when you are away from the computer. Checklist – A 6 page PDF report that will help your buyers get that entrepreneurial drive and find success, step by step that they can check off each step as they go and have a much better change of reaching their goals. 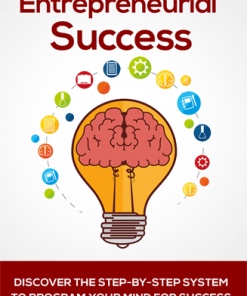 Resource Cheat Sheet – 12 page PDF that lists Entrepreneurial Drive Ebook and Videos resources including resources on grit, positive thinking, essential resources, motivation, time management and goal planning. Mind Map – Gives a useful overview or a visual of the Entrepreneurial Drive Ebook and Videos system, so your buyers can see the big picture and better understand the concepts. In 3 different formats, JPG, PNG and a handy HTML version for the web. It can help your customers to “get it”. Plenty of visual learners out there. Squeeze Page – New professional and modern opt-in page with a progress bar to help encourage sign-ups and increase conversions. 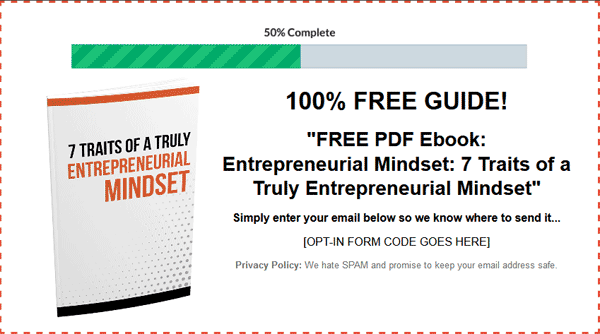 You will also be getting a lead magnet, 9 page PDF, “7 Traits Of A Truly Entrepreneurial mindset, to build a list or email subscribers quickly and easily. Just copy and paste your autoresponder opt-in code into the squeeze page, upload and it’s ready to build you a list on automatic. Includes a thank you page for your new subscribers to download the free report. Report is in DOC format, so you can edit or change, or brand it as you want. Perfect place to link to your sales page and drive more sales. 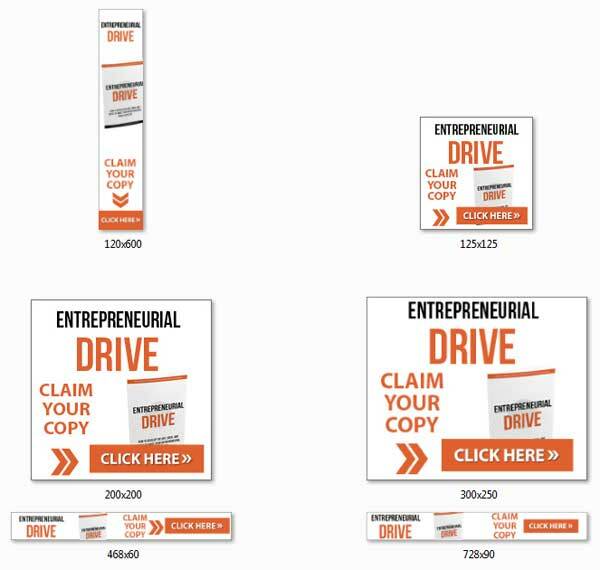 Promotional Banners – 6 professional Entrepreneurial Drive Ebook and Videos banners you can use to drive buying traffic to your new sales page. In the popular sizes of 120×600, 125×125, 200×200, 300×250, 468×60 and 728×90. In both JPG and GIF. Just add them on your blog or website and link to your sales page. Easy as that. Drive more traffic and sales. Perfect sizes for many blog sidebars. Graphics – All kinds of images here with plenty of ecovers in different styles and sizes including, flat, Box, Bundle, DVD, Ebook, Stacked, Lead Magnet and more. Also arrows, bullets and buttons. 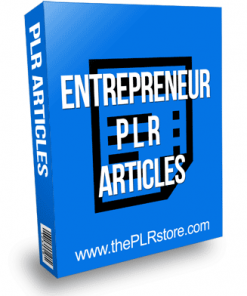 Articles – 10 quality articles all about business and entrepreneurial success and more. Perfect content to use for promoting your new product. They come in text and Word DOC formats. Ready to use on your blog or website. You could also use them as email messages. Content that is pre written and ready to use. Copy and paste easy. Titles are listed below. Email Swipes – Four pre-written text Entrepreneurial Drive Ebook and Videos autoresponder messages including, Lead Magnet/Opt-in, Sales Page (short copy), Sales Page and Subject Lines. Copy and paste them into your autoresponder service and you are done. No need to struggling writing your emails, we already did it for you. Copy and paste them into your autoresponder service and they do the selling for you. Social Media Images – 10 quality Entrepreneurial Drive Ebook and Videos package JPG images for your social profiles to draw in buyers from the large social media websites. Each Image has a background image with a text quote overlay. All In JPG format. Just post them on your social networks with a link to your sales page and you could have even more traffic hitting your page. Quotes also come in a separate text file. So… I also have a huge upsell or one time offer for you that is loaded with even more material and another way to put some extra cash in your pocket. It’s a built in sales funnel that is easy to set up and get running. Plus, the upsell content comes in even more popular formats including video and audio. And you know how hot video is for learning. 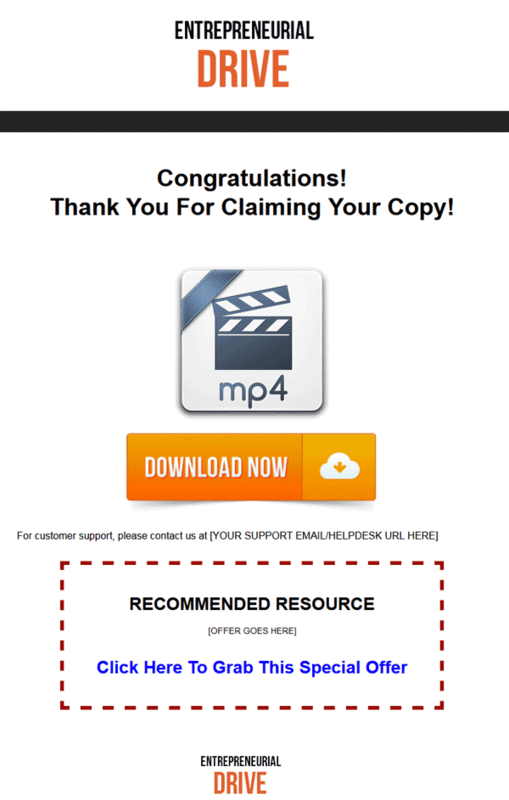 Videos – 10 professional MP4 video’s that covers the same content in the Entrepreneurial Drive Ebook and Videos is your ready to profit from digital product for the huge self improvement niche. All you need to sell plus big upsell kit. guide. You know how many people prefer video these days, so it can be a great upsell and a way to make more from each buyer you have. And since content is so tightly related, it’s the perfect related upsell. It’s a built in sales funnel, done for you. Also being in MP4 format, you’ll know they are easy to use on your website or blog, even easier with wordpress. Upsell kit – Comes with everything you need to resell the Entrepreneurial Drive Ebook and Videos Upsell addition, it is your ready to profit from digital product for the huge social marketing niche. All you need to sell plus big upsell kit. upsell in place and making you more money. Simply insert your payment link to the sales page and your download link on the thank you page, upload the two web pages and it’s ready to make you money all on auto-pilot. Here’s where you could make even more from every buyer. They trusted you enough to buy the main product and since the upsell content is so related, there is a good chance many will purchase the upsell as well. Audio Files – 10 professional MP3 files that go over what is taught in the main ebook and the video’s. And who doesn’t have a device that can play MP3 audio these days? Most every one. From mobile phones to tablets and other electronics. And with the fact that many people like to learn while they are on the go, this could be a great opportunity to get those extra upsell sales. Easy money as they say. 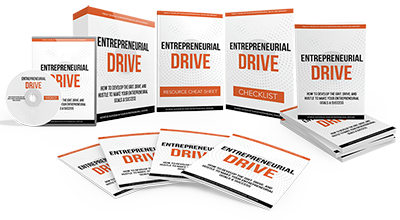 7 Day Autoresponder Series – 7 pre-written Entrepreneurial Drive Ebook and Videos. Email messages in text format, just for this product. They are content based and promotional, the best of both worlds and another opportunity to make some sales. Easy to customize and make them your own, then just copy and paste them into your autoresponder service and they are read to work for you 24/7 on automatic. The list alone could make you profits far in to the future. Just imagine all the related products you could promote to this list. 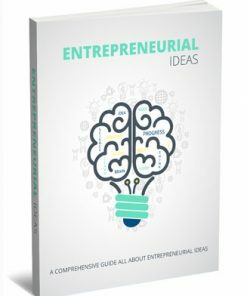 Special Report – A quality 14 page PDF report entitled, “The 5-Minute Guide To Developing Your Entrepreneurial Mindset”. It gives your new subscribers a taste of the content, and leaving them wanting more and it’s the best time and place to promote your main or your upsell product. Since PDF, you know your subscribers won’t have any trouble enjoying and reading the content. Affiliates Toolbox Page – Make even more sales for your Entrepreneurial Drive Ebook and Videos is your ready to profit from digital product, by having others do the work for you and you only have to pay them when they makes you sales. Ready to use web page to recruit affiliates that can do the promotion and selling for you. Built into the page are Email Swipes, Banners, Social Media Swipes, Forum Signatures and Email Signatures. Everything your affiliates need to promote your product. I can tell you from experience, it has more promotional content than many affiliate programs provide, so more affiliates for you. Social Media Swipe Kit – 4 text files for the Entrepreneurial Drive Ebook and Videos is your ready to profit from digital product for the huge self improvement niche. All you need to sell plus big upsell kit. promotional material on the affiliates page. Including Email Signatures, Facebook & Google Plus Posts, Forum Signatures and Twitter Tweets. So simple, just copy and paste on your social profiles and walls and you are done. Drive more traffic. Top Forums and Blogs – 2 reports, Top Blogs and Top Forums. In PDF format for easy use by your customers. Giving them even more ways to gain buyers and traffic. Keywords – 4 keyword reports so you can target those buying customers. PDF, Broad Excel, TXT Facebook Ads and Narrow Excel file. Includes Board matches for the running niche. Featured Images – 6 quality Entrepreneurial Drive Ebook and Videos featured images perfect to add to your blog to drive traffic. 5 in size of 600×314, one feature box special offer in size of 595×605 which is perfect for promoting this product. All in PNG. You’ve always dreamed of leaving your 9 to 5 job and starting your own business. You’ve spent years working on your business plan and looking at possible locations. So, why haven’t you taken that first step to entrepreneurial freedom? You may be held up on all the unknown aspects of being your own boss, making an excuse after excuse for not taking the first step to realizing your dream of being an entrepreneur. Do These Excuses Sound Familiar? Everyone has their own excuses for why they don’t take the first steps to becoming an entrepreneur. When people are scared and unsure of their abilities, they make excuses for staying in their current position, a position that is comfortable and makes them feel secure. They stay where they are comfortable, never taking chances and being miserable the entire time. They are afraid of being the 49 percent of businesses that fail every year. They don’t even consider the 51 percent of new companies that succeed. They don’t believe that they have what it takes to achieve their goals. So, how do you overcome the excuses so that you can become an entrepreneur? But what is grit? Grit is the belief that you can conquer anything as long as you stick with it. It is the determination you have to win, no matter what. It is not giving up or giving in, even when faced with insurmountable odds. Every successful entrepreneur has grit. It is not something that they were born with, but rather something that they worked hard to develop and continue to maintain along the way. What if you could develop grit? Would you stop making excuses and finally start on your journey to entrepreneurial success. If your answer is yes, keep reading. 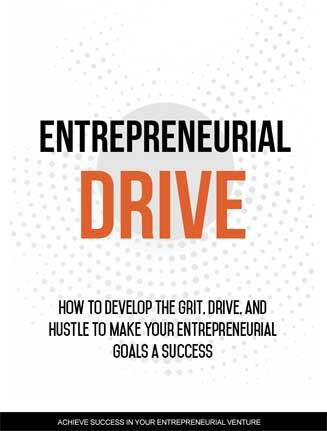 I’ve created a new guide to show you how to develop your grit, drive, and hustle so you can become a successful entrepreneur. Let me introduce you to. 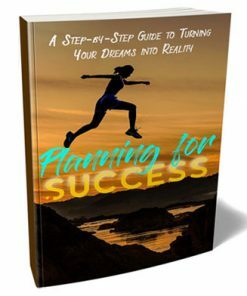 This guide takes you through the characteristics of a gritty person, the habits that gritty people develop, and shows you what you need to do to build your grit to leave your old life and become a successful entrepreneur and turn your dreams into reality. FAST-ACTION BONUS #3: Mind map – A quick glance over this mind map and you’ll get an instant refresher of all the major points and action steps from the main guide. If you choose to pass up this offer, how are you going to learn how to develop your grit and become a successful entrepreneur? Are you going to finally leave your 9 to 5 job to start your entrepreneurial venture? The chances are highly unlikely without the information and valuable resources contained in this guide. Make the investment in yourself and learn everything you need to develop your grit, drive, and hustle to make your next entrepreneurial venture a success. P.S. According to the Small Business Administration, an average of 627,000 new small business are started every year, with more than 51 percent of those companies staying open for more than five years. With statistics like that, it’s time for you to step out of your comfort zone and start on your path to entrepreneurial success. P.P.S. You’re not alone in your excuses for not starting your own business; the question is, are you ready to ditch the excuses and take the next step for starting on your entrepreneurial journey? If you’re prepared to take the plunge, click the Add To Cart button to get instant access. Video #1 – Characteristics of a entrepreneurial spirit. Video #2 – Habits of highly successful entrepreneurs. Video #3 – How to develop your optimism to drive toward success. Video #4 – How to discover and sustain your entrepreneurial drive. Video #5 – How to replace procrastination with willpower. Video #6 – Keys for motivating yourself and finding your drive. Video #7 – Keys to business success. Video #8 – Signs you have an entrepreneurial mindset. Video #9 – Traits of an entrepreneurial mindset. Video #10 – Ways to develop your entrepreneurial mindset. 1. You’re granted master resell rights, resell rights or to resell with personal use rights. Price for resell is strictly $7.00 minimum. 2. You may add this product to your PAID membership site. 3. You may giveaway the product as a bonus when people buy through your affiliate link. 4. You may edit the included sales page and opt-in page. 5. No, you may NOT edit the contents of the eBook(s). 6. No, this product does NOT include private label rights. You are granted Master Resell Rights only. 7. No, you may NOT giveaway the main eBook for free. Must be sold for at least $7.00. Here's a sample of the video's to give you idea of the quality. Note the quality is better full screen.